Green Tea & Roasted Rice Chocolate, 2.2 oz / 60g (Eclat Chocolate) - Penn Herb Co. Ltd.
Roasted brown rice and green tea are a classic combination, whether brewed together to make Japanese genmaicha, or as a perfect parallel in this chocolate bar. 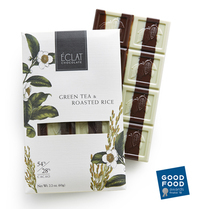 Éclat Chocolate nominated finalist for the 2018 Good Food Awards. Dark Chocolate (min. cocoa mass 54%, sugar, cocoa butter, soya lecithin, natural vanilla), White Chocolate (min. cocoa mass 28%, sugar, cocoa butter, whole milk powder, soya lecithin, natural vanilla), Green Tea Powder, Roasted Rice. Produced in a facility that handles peanuts, tree nuts, milk, wheat and soy.